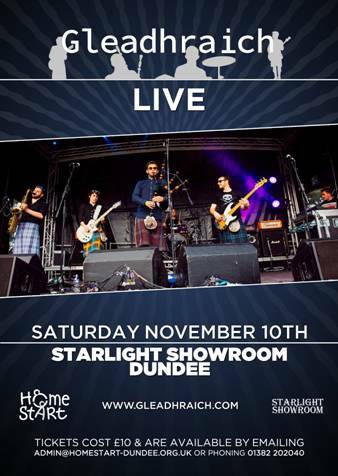 We are delighted to announce that Gleadhraich will be performing a fundraising gig with all proceeds coming to Home-Start Dundee. 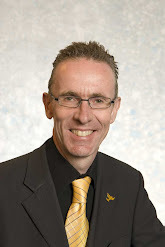 Gleadhraich are a celtic rock band formed in Carnoustie in 2010 while students at school. The band is made up of Craig Weir (Bagpipes/ Vocals), Ross White (Guitar/ Vocals), Paul Weir (Percussion) and Graeme Ritchie (Bass Guitar) with a live addition of a backing band which includes saxophone, trombone, accordion, keyboard and fiddle. The band was made Angus’ Cultural Ambassadors for 2013/14. At a Dundee performance in 2016 Gleadhraich welcomed Britain’s Got Talent winner, Jai McDowall and Bay City Roller’s onstage to play with the band as special guests. The band has performed at a variety of events across the UK from headline shows to festival performances including at Scotland’s prestigious Belladrum Tartan Heart Festival. This has led to the band sharing stages with acts such as Skerryvore, Donnie Munro, Twin Atlantic, AC/DC, The Fratellis and Peatbog Faeries. Gleadhraich made their German debut with a successful mini tour in September 2015 and featured in France in January 2016. Gleadhraich made their US debut at New York Tartan Week in 2017 with further performances scheduled in Germany and Switzerland. The band has featured on many national media platforms such as BBC, STV, S4C, NME, Magic FM and many more. For more information about the band check out their website here. We would be delighted if as many of you as possible could join us and raise money for Home-Start. Tickets are priced at £10 and are available by telephoning 202040 or email admin@homestart-dundee.org.uk.